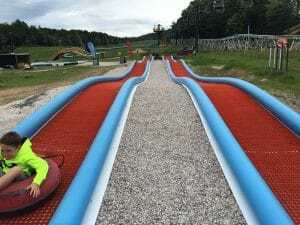 Killington installed a large, 700-foot mSnow Tube Slide for the summer of 2016. Additionally, they installed a pair of Kids Bumper Tubing Lanes for the very young participants. The adult lane features 5 high speed banked turns, while carving a serpentine path down Snowshed. The Kids Lanes are near the base and are always a hit with the little ones!